Examining the dynamic between U.S.-Pakistani relations and the American response to Pakistan’s nuclear ambitions offers valuable lessons in long-range planning and balancing strategic objectives. The Pakistani nuclear weapons program has been undertaken over a span of more than fifty turbulent years, during which time Islamabad’s relations with the United States have varied widely. Today, the U.S.-Pakistani nuclear relationship remains critical to international security as Pakistan’s nuclear potential is intertwined with issues of regional stability and Islamic terrorism. Moreover, study of the U.S.-Pakistani nuclear dynamic illustrates how a lack of overall direction and interagency planning impede U.S. policy effectiveness and continuity. U.S. reactions to Pakistani nuclear developments have been largely ad hoc, a pattern that extends from the administration of Richard Nixon to that of George W. Bush. As a rule, other American strategic priorities (e.g., engaging the Soviet Union, strengthening global stability, or waging the Global War on Terror) eclipsed nonproliferation concerns in Washington. When U.S. officials considered Pakistan an essential ally, proliferation considerations were de-prioritized. At these times, the United States government had leverage with Pakistan but it was reluctant to use it. Several administrations were thus willing to publicly accept official Pakistani claims that there was no weapons program, that Islamabad was unaware of systematic sales of nuclear technology, or that nuclear sales had been stopped. When Pakistan was not considered an essential ally, ties between Washington and Islamabad were often dismal, stemming from U.S. (especially congressional) objections regarding human rights, democracy, and weapons activities in Pakistan. American non-proliferation efforts at these times usually emphasized the cessation of U.S. aid to Pakistan. This course of action was ineffective and may have done more harm than good by pushing Pakistan’s military leaders to tighten internal controls and expand nuclear sales programs. The presidency rarely galvanized the national security apparatus to combat proliferation in and stemming from Pakistan. Interagency cooperation, as well as cohesive interagency policy development, suffered as a result. For much of the period in question, the problem was not with individual rivalries between agencies, but at the top, where an absence of high-level leadership effectively minimized nuclear concerns. Indeed, several interagency intelligence and working groups effectively tracked Pakistani proliferation activities. The only significant area where differences in organizational culture played a role in cross-departmental activities was with sensitive intelligence information. Conflict over the use of intelligence––to expose nuclear traffickers, for example––was due to the differing priorities of intelligence agencies, which required information secrecy, and law enforcement and/or diplomatic agencies, which demanded varying degrees of transparency. The most striking aspect of fifty years of U.S. relations with Pakistan is that the relationship has been almost totally transactional. Prioritization of other objectives has meant that Pakistan has seen a regular rotation between being the essential ally of the moment and being an outcast. The U.S. response to Pakistan’s nuclear capabilities has been rendered correspondingly inconsistent. Absent long-range, integrated U.S. planning on the Pakistani nuclear question, Washington proved generally ineffective at minimizing the risks posed by Islamabad’s nuclear program. Washington halted neither the development of a Pakistani nuclear bomb nor the dissemination of nuclear technology from Pakistan. In early years, the American approach did not check the steady advance of Pakistani nuclear development. 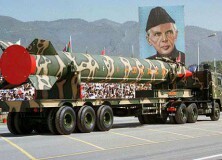 In the 1980s, Pakistan created its first nuclear weapons, acquired delivery systems, sold nuclear technology, and helped bring the threat of nuclear war to South Asia. In the 1990s, Pakistani proliferation expanded, with major sales of equipment and technology to Iran, Iraq, Libya, and North Korea. Meanwhile, the legacy of fluctuating U.S. support for Pakistan reinforced the image of the United States as a fair weather friend lacking real commitment to the well being of Pakistanis. In the past decade the United States scored several victories against Pakistani proliferation. U.S. intelligence brought about the neutralization of A.Q. Khan and his nuclear black market. Additionally, Islamabad’s acceptance of U.S. security assistance for Pakistani nuclear sites marked an important achievement. Unfortunately, these gains have been overshadowed by decades of setbacks. Furthermore, the current nuclear crises with Iran and North Korea, as well as the threat of Islamic terrorists acquiring nuclear materials within Pakistan, have been exacerbated by the past failure of U.S. nonproliferation activities vis-a-vis Pakistan. The American approach to the Pakistani nuclear program illustrates the difficulties the United States government encounters in crafting long-range strategy and in balancing competing policy objectives. An absence of long-term planning on the Pakistani nuclear question resulted in little policy continuity between administrations and a general failure to address underlying drivers of the nuclear threat, such as Indo-Pakistani-Chinese rivalries and the Pakistani military’s ties with radical Islamic groups. The costs of these shortcomings continue to undermine U.S. national security.